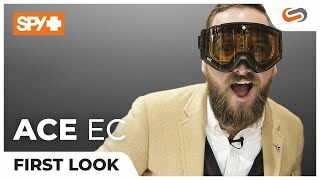 SPY Ace EC is the only snow goggle for this season. 3 tints, 1 lens. SPY delivers an experience on the mountains with their advanced electrochromic lens change system. The Ace EC is the first goggle to feature Spy's new lens technology that helps take your experience to the next level. With one touch, an electronic pulse is sent through an invisible filament sandwiched between an injected cylindrical dual lens to instantly change the tint of the persimmon-based lens. Three settings, are controlled by a lightweight battery pack that allows you to instantly adjust for any light condition—sunny, mixed, or flat in a quick and easy manner.